Join other woodland landowners throughout the region to learn about how you can take better care of your woodlands. N.C. 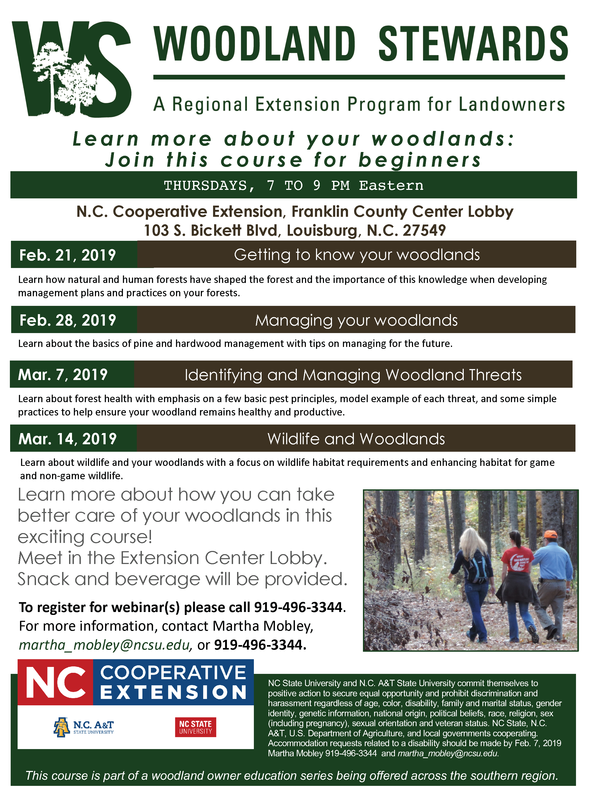 Cooperative Extension, Franklin County Center will be offering a 4-consecutive-week, Thursday-evening series on Forestry for Beginners, beginning February 21, 2019, from 7–9 p.m., at 103 S. Bickett Blvd., Louisburg, in the lobby. Dinner will not be served, but light snacks will be available. To register for one or more webinars please contact 919-496-3344. For more information, contact Martha Mobley, martha_mobley@ncsu.edu , 919-496-3344.